This spring a very special collaboration sprung up between the Tuscany wine estate Villa Dianella Fuccini near Vinci and the Polimoda fashion school in Florence – a contest open to second year students in the Marketing Management, Marketing Communication and Masters in Fashion Communication programs to design the new label for the estate’s rosé wine, All’Aria Aperta. Yesterday at the estate the 3 finalists met to present their designs so that the panel could decide on the contest winner! 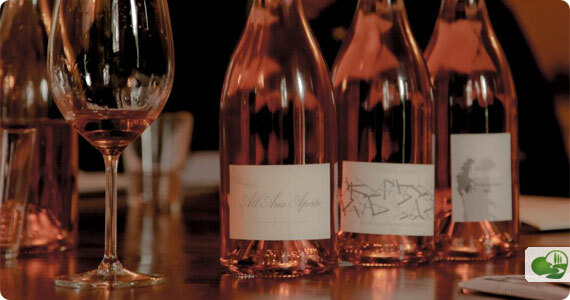 A wine label design is not just a summary of the wine or its contents – it must communicate the essence of the wine and the passion put into its production. For the great majority of us who are not wine experts, labels are pretty important and can be a deciding factor between one bottle or the next. The fashion school students’ participation is thus a very important chance for students in the marketing sector to put their studies into practical application while giving the wine estate the chance to offer a new and innovative design not usual for wine labels. Villa Dianella is a 15th century Medici villa that today produces Chianti wine and liquors such as grappa and vinsanto and extra virgin olive oil. The estate also has several delightful elegant rooms where guests can enjoy a stay in the elegant estate and participate in cooking classes, wine tastings and a tour of the winery’s cellars. Polimoda is one of the top fashion marketing and design schools in Italy and offers both undergraduate as well as masters programs to students specializing in various aspects of the fashion world: marketing, communication, branding, management and much more.